SOLVANG, CALIFORNIA. A little "off the radar" to non-Californians, it's a bit of Denmark in the heart of California's Central Valley wine country, and is situated near the more famous SANTA BARBARA. The 100-year-old Danish town of Solvang is often referred to as "Little Denmark, Danish capital of America". It was founded by three Danish immigrants who were educators and pastors. The name "Solvang" itself means "sunny fields". Solvang was incorporated in 1911, and acquired almost 10,000 acres of prime land in the Santa Ynez Valley. Advertisements appeared in Danish-language newspapers around the world. Early land purchasers, almost all Danish, came from other parts of California, the US Midwest, and Denmark. Today, Solvang still looks like a Danish village and is filled with shops and restaurants which capitalize on its heritage. Bakeries abound, too. Solvang has recently been named a "Preserve America Community" by the Advisory Council on Historic Preservation in Washington, D.C. 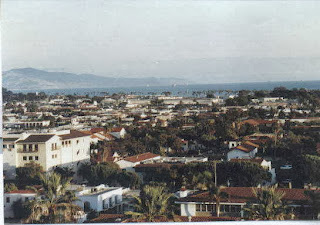 Nearby is charming, sophisticated Santa Barbara -- often called "the American Riviera". Originally home to Spanish missionaries, Historic Santa Barbara roots trace back to the Old Mission Santa Barbara which was founded by the Franciscan Friar Fermin de Lasuén on the Feast of Santa Barbara, December 4, 1786. Modern Santa Barbara is an urbane, very cultured "bedroom community" to Los Angeles and is home to many of Hollywood's rich and famous. Strolling along State Street, sitting in sidewalk cafés, taking various guided walking tours, and visiting the superb Santa Barbara Museum of Art are all part of the ambiance of Downtown Santa Barbara. I can't wait to check out this tour. My husband and I frequent the Santa Barbara area quite often and are always looking for new wine tours to try. Just last weekend we were there and stayed at a great little hotel on State, the Sandman Inn (www.thesandmaninn.com), which was within walking distance of the downtown wineries. Santa Barbara is always a beautiful travel destination! Nancy, we hope you and your husband will come with us either in November 2011 or in August 2012. We love Santa Barbara, too! Generally, we stay at The Upham b/c it's both historic and close to State Street. On this particular tour, however, we're closer to Santa Ynez Valley wineries north of SB by staying in Solvang. If you haven't been to Solvang in a while, you are really in for a treat! If you have any questions about our Solvang/Santa Ynez Valley wineries tour, please don't hesitate to contact us.